The major UK banks saw a 45% rise in core profits in 2012, but that hike was wiped out by a mix of regulation and their own mistakes, a KPMG report says. Its performance report looks at Barclays, HSBC, Lloyds Banking Group, RBS and Standard Chartered. It says the banks' combined core profits last year were £31.5bn. But this was eliminated by the "cost of past mistakes and increased creditworthiness of their own debt", the audit firm's report says. This development meant that the major banks actually saw their statutory profits slump 40% on the previous year, at £11.7bn, KPMG added. 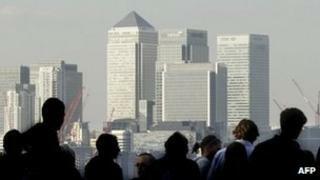 The banks, it says, were hit by PPI costs of £7.4bn - up from £5.7bn in 2011. In addition, there were other fines and penalties from regulators and "redress provisions" of £4.7bn, and a £12.8bn accounting hit for losses caused by the revaluation of "own debt'", "reflecting the credit markets' more positive view on bank issuers and interest rate movements". "Banks had a better performance year in 2012 but their improved core profits were eaten up by fines and other exceptional items, leaving them down on 2011," said Bill Michael of KPMG. He added: "In terms of their reputations, 2012 was a dire year. This is why it is so important for them to address cultural and ethical perceptions and issues. Restoring customer trust is critical." However the report does acknowledge the improvement in core performance from the banks, and says it is due to two main factors. Better credit performance has meant that impairment (bad loan) charges have continued to fall with continued low interest rates enabling the majority of customers to pay their mortgages and even reduce their credit exposures. And stronger investment banking results have meant that revenues were generally up, especially in rates businesses, helped in large part by more positive sentiment surrounding the future of the eurozone. "Overall, banks have made progress," said Mr Michael. "They have strengthened their balance sheets and made strides to bolster their capital. "They are becoming better able to carry out their essential function of providing support to businesses and promoting economic growth. However, the necessary changes to address conduct and behavioural failings will have a significant cost."